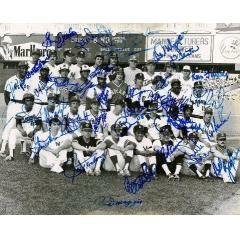 Here's a great autographed photo featuring some of the best AL players from the 70s. 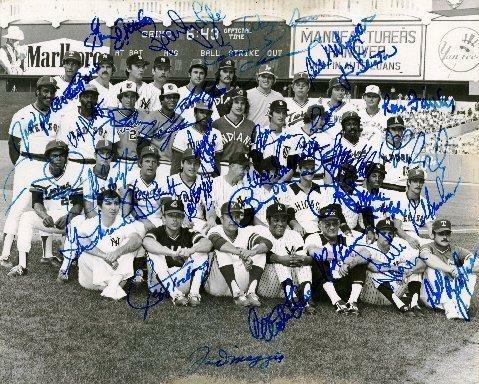 This photo was taken at the 1977 All Star Game played in Yankee Stadium and features the members of that year's AL team, and includes the autographs of 36 members, including Manager Billy Martin and honorary AL Team Captain Joe DiMaggio. Jim Palmer, Carlton Fisk, Rod Carew, Willie Randolph, George Brett, Rick Burlson, Reggie Jackson, Carl Yastrzemski, Richie Zisk, Vida Blue, Bill Campbell, Dennis Eckersley, Mark Fidrych, Jim Kern, Dave LaRoche, Sparky Lyle, Nolan Ryan, Jim Slaton, Frank Tanana, Thurmon Munson, Butch Wynegar, Ron Fairly, George Scott, Jason Thompson, Don Money, Wayne Gross, Graig Nettles, Bert Campaneris, Larry Hisle, Ruppert Jones, Fred Lynn, Jim Rice and Ken Singleton. Due to the singular nature of this offer we must charge your credit card for the full amount immediately upon taking your order to ensure we reserve the photo for you. We will confirm your order by Email. Please allow at least 2 weeks for delivery. 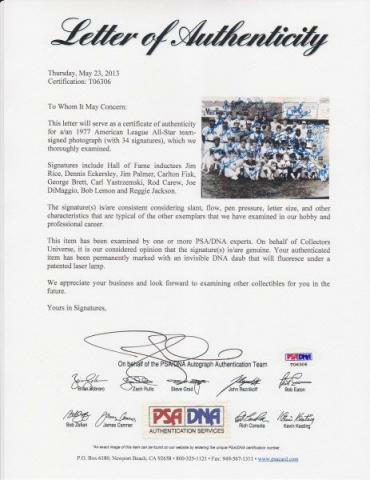 Autographed Photo - 1977 AL All Stars $1,995.00 Sold Out!